Do you even life, bro? 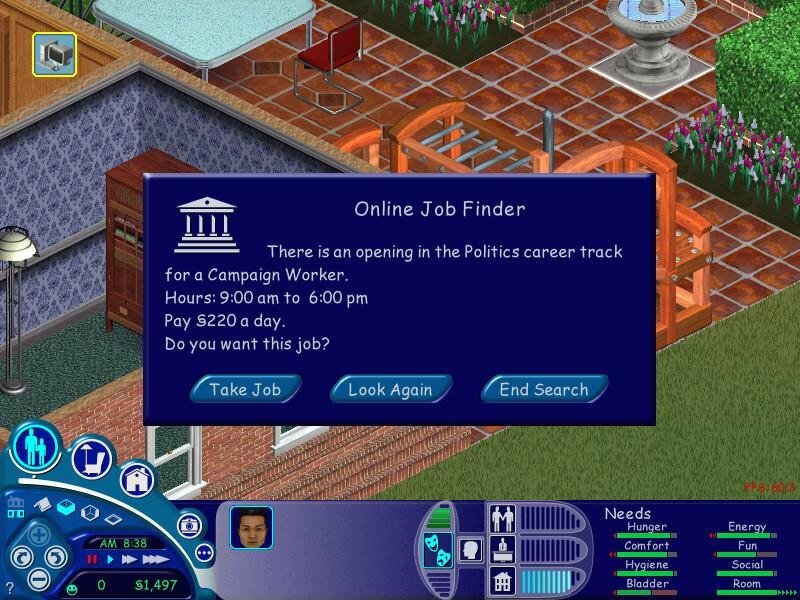 It was perhaps inevitable that if anybody was going to take the next step in “people simulation” it would be Will Wright, the designer who was behind the SimCity series. And that’s exactly what he’s done with The Sims, a game – I guess you can call it a game, although as is Wright’s trademark, you never really win or lose – that allows you to create and control the lives of virtual people known as “Sims”. 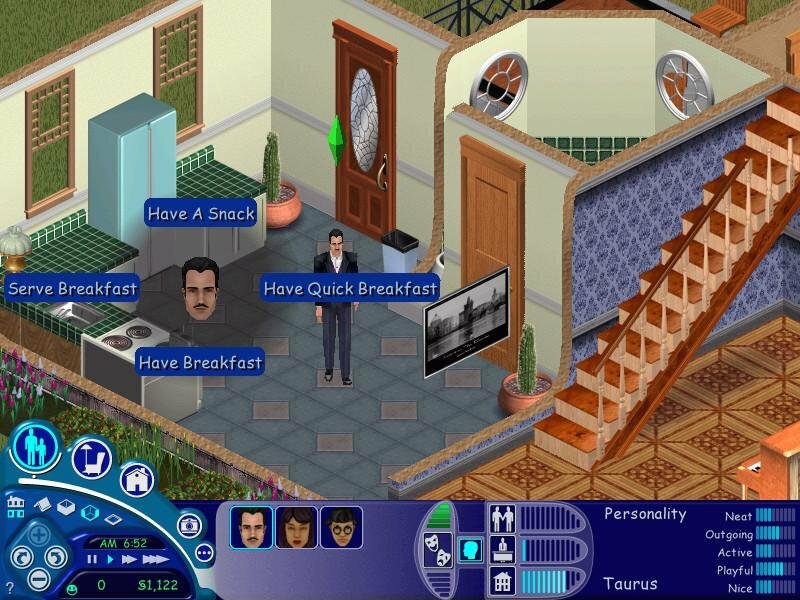 Indeed, at its core The Sims is a sort of virtual people farm of everyday life management. The concept at its foundation – the interactive simulation of a person’s everyday life and all that it entails – is ambitious in the extreme, and amazingly the design does it ample justice. 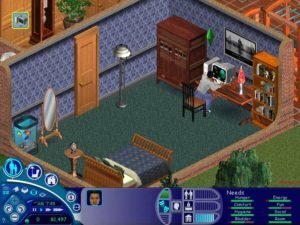 The lives of the Sims under your control are faceted and detailed enough that, just like all of us in the PC Gamer office who have become curiously entranced, you’ll actually find yourself believing that you’re living somebody else’s life vicariously. 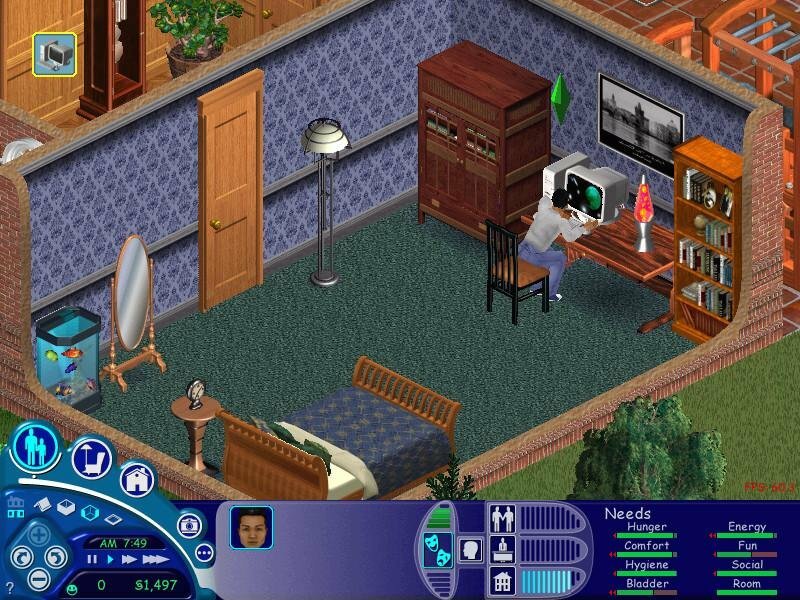 Your Sim becomes a virtual alter-ego through which you can attempt to make real your dreams – or, perhaps, nightmares. 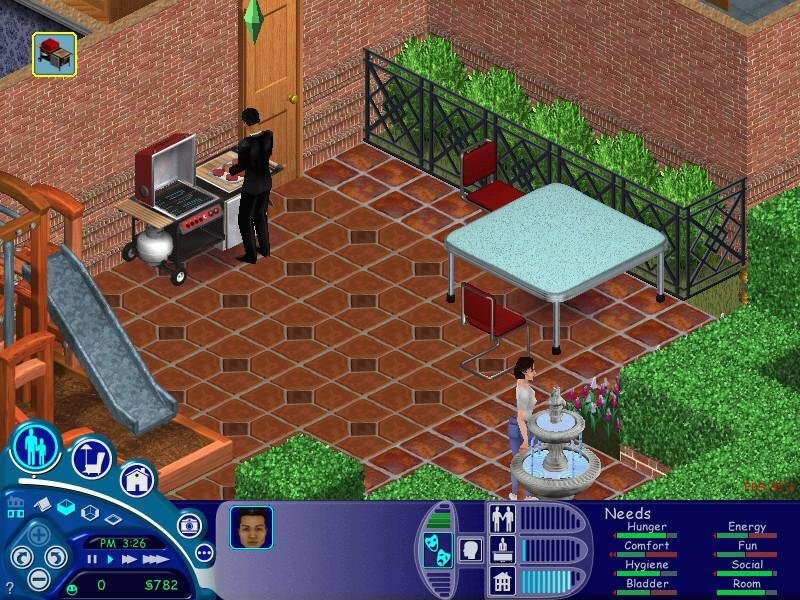 The Sims is essentially divided into two sections – a “Live” mode in which your Sims work, play, and interact, and a Buy/Build mode that freezes time to allow you to change the environment. 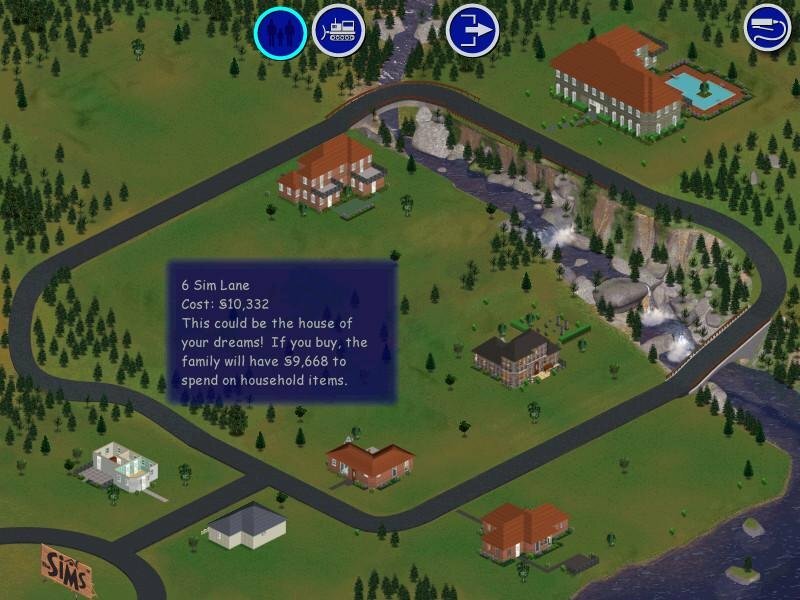 The heart of The Sims is a leafy suburban neighborhood comprising pre-built houses of various size and value, along with several vacant lots to build new residences on. From the very beginning – acquiring a house and furnishing it – you’re in management mode, trying to balance your tastes against the meager $20,000 you start out with. 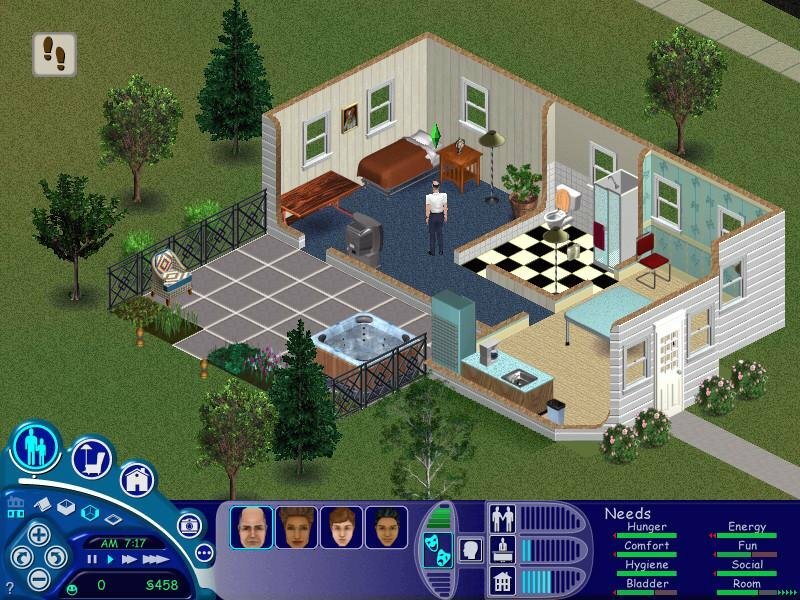 As more money becomes available throughout the game, so to does your freedom to buy from the game’s extensive catalog of furniture, decorations, appliances, gadgets, and other material trappings, and to roll up your sleeves and remodel the house itself with a powerful architectural tool that allows you to design everything from the house’s overall layout to the wallpaper, carpet, windows, and staircases. 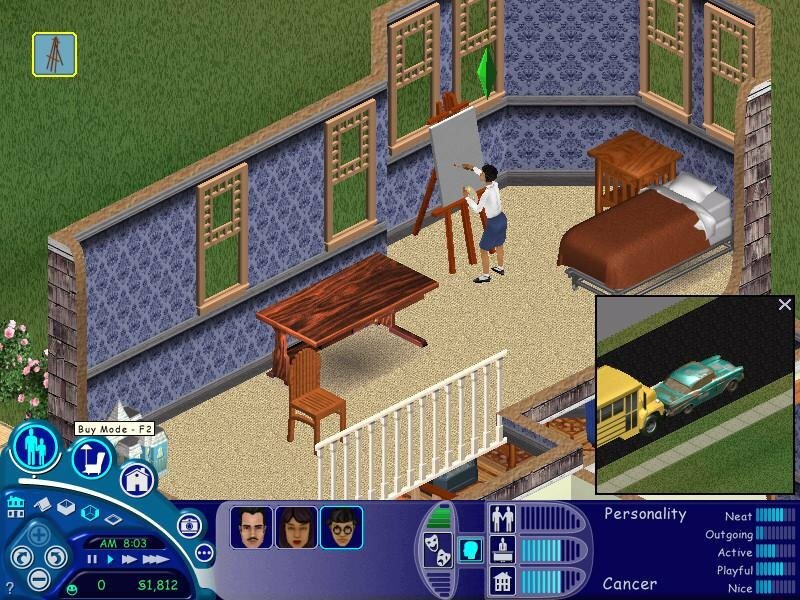 When you’re not sprucing up your house with the latest furniture, TV sets or pool tables, you’re actively managing the everyday lives of your Sims. 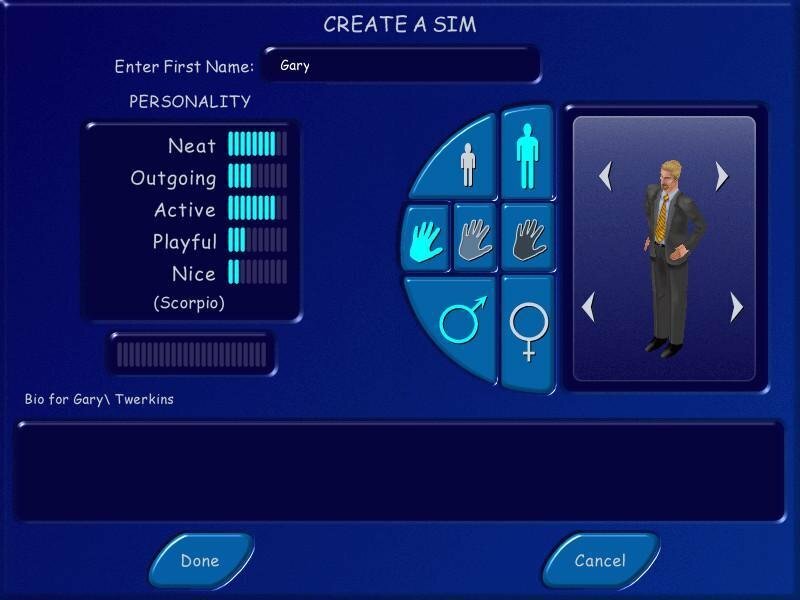 This being more of a computer toy than a game proper, the user is free to define their own objectives, but as in real life, you’re encouraged to achieve social and professional success which in turn are the key factors in determining overall happiness. Expect burglars if you have an oppulent home! A view of the neighborhood. Once putting your Sim on a career path, either by perusing the newspaper or online job listings, career advancement becomes a major goal. After struggling up through the low pay and long hours inherent to the lower ranks of whatever career you chose (everything from medicine and politics to sports, entertainment, and a life of crime is possible), you can start earning some serious cash, which can afford better home improvements (which, in turn. enhances the happiness of our materialistic Sims). 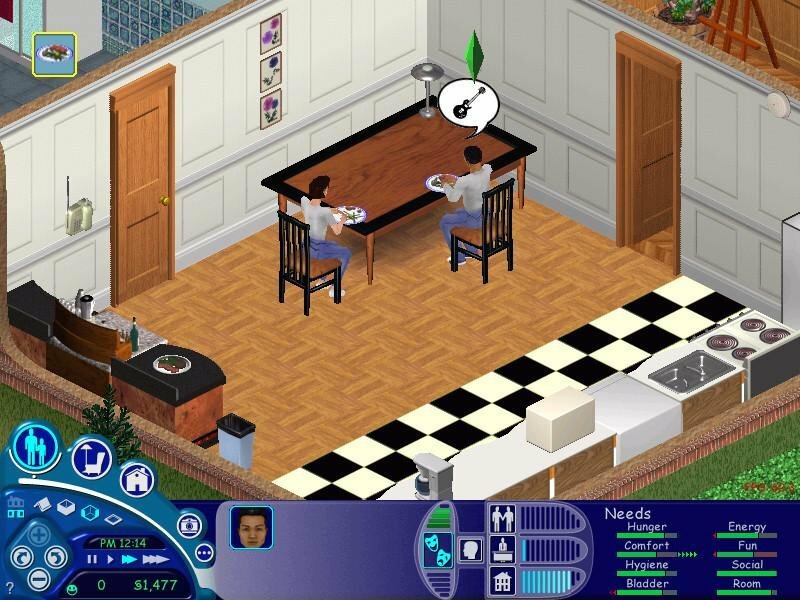 The other key goal of The Sims is to develop an active social life, and it’s here – interacting with other Sims in the neighborhood – that the game throws up some of its most satisfying treats. Socializing is mandatory if you want to get ahead, since a Sim’s social rating is one of the key contributors to overall happiness and promotion to the higher career levels also requires that a certain number of Family Friends be maintained. You can use computers for fun and work. 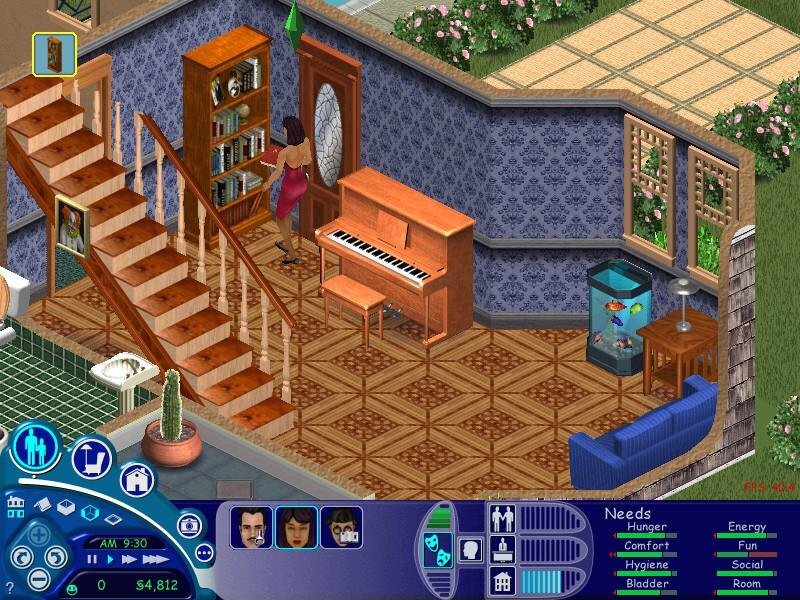 As you get to know the Sims in your neighborhood, you can call them and invite them over. Once you’ve gained the pleasure of their company, you can chat, play, joke, flirt… whatever it takes to get them to like you. Certain household items can help move things along – well, wouldn’t you be more likely to visit a friend if you knew he had a big-screen TV? 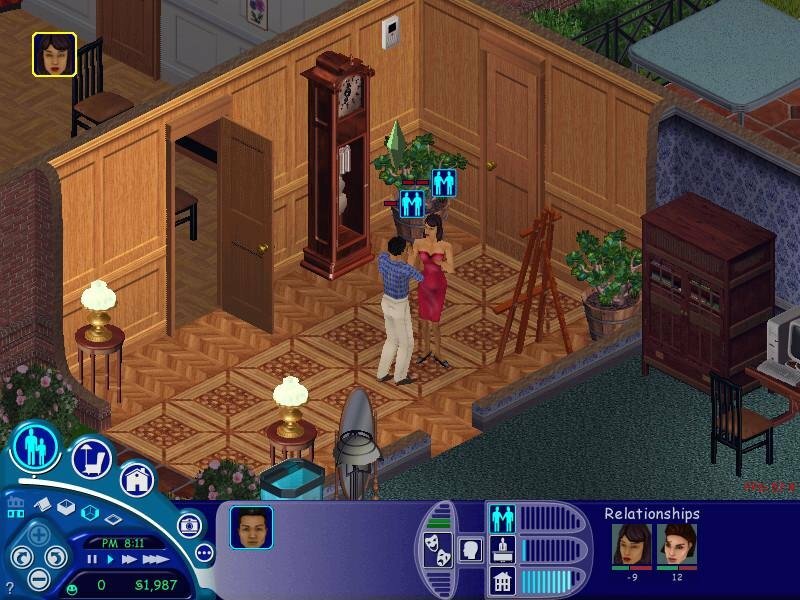 A horoscope system adds an extra layer of complexity, with astrological compatibility affecting Sims’ predisposition toward each other. 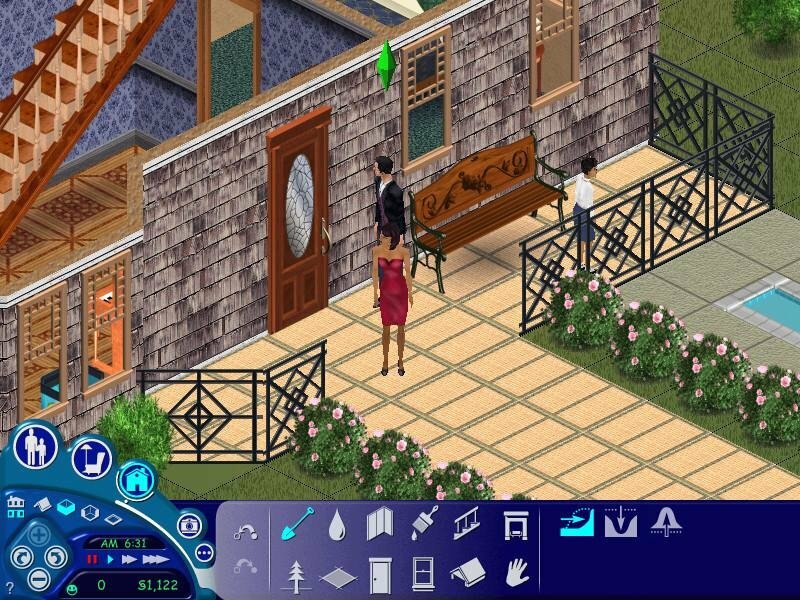 Get friendly enough and Sims may become romantically inclined toward each other, and even move in and start a family. 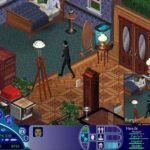 It may be pointless in the long run – with no aging or clear objectives, one can only take The Sims as far as achieving a successful career and perhaps moving into a luxury mansion. Make it high enough and you’ll be throwing lavish parties with your pals down by the swimming pool. Getting there isn’t easy, requiring weeks of playing and exploring all of the game’s charming minutia. 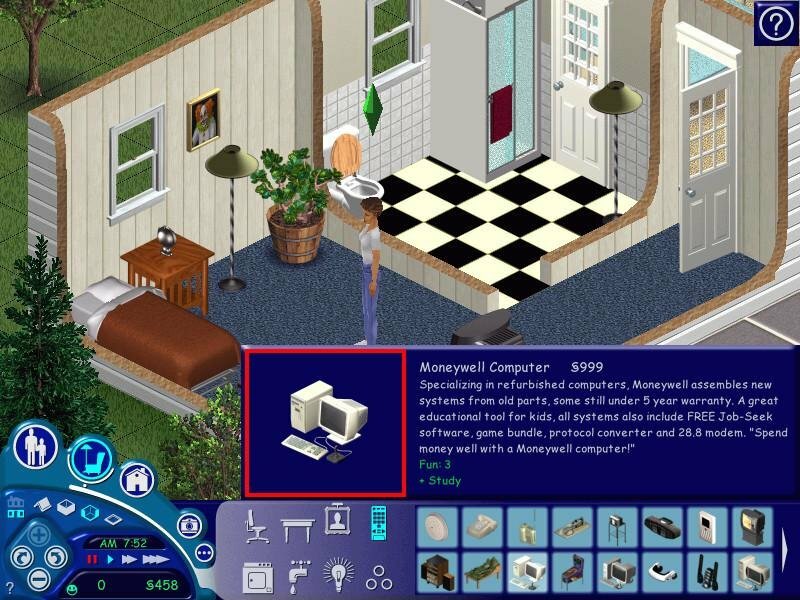 In the end, there’s one thing that’s safe to say about The Sims – you can’t find anything quite like it. Pleaae give the instruction after download is finished. 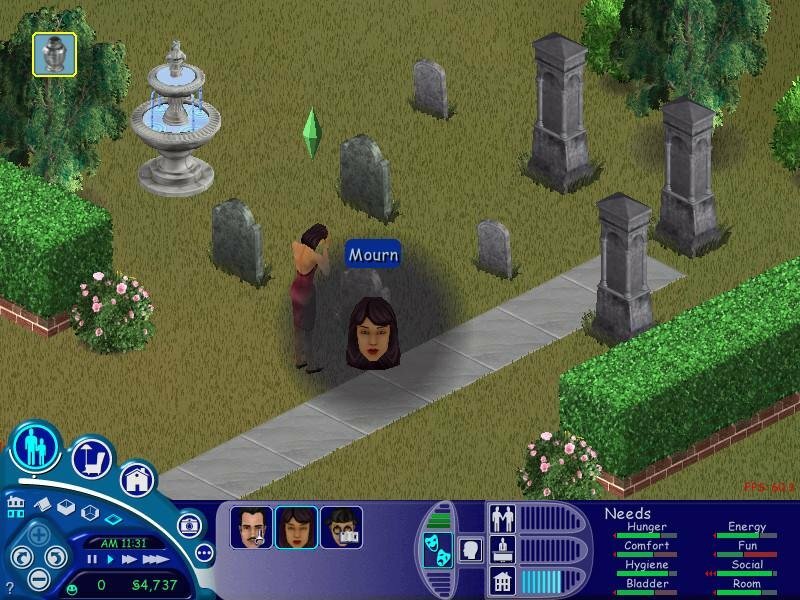 this game Is too old and we have newer sims right and also expansion packs! Once this is downloaded, extract the files and then use Daemon Tools to mount the MDF file as a CD. This allows you to install the game. Use the serial.txt file contents as your game key. Once installed, go into the Crack folder and extract the folder in there. 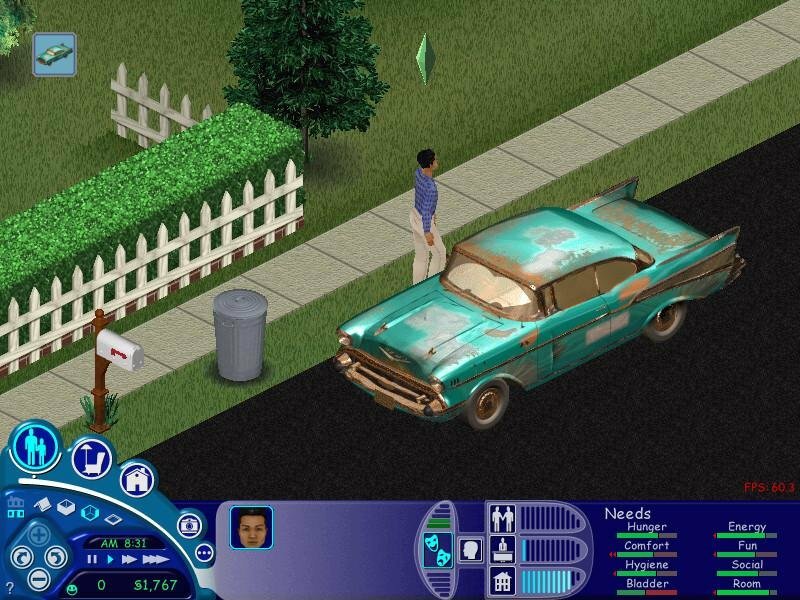 This contains a Sims.exe that you need to use to run the game. I installed this and got it running fine, but suddenly I have no sound whatsoever. My sound is working fine in other games, just not this one. Any suggestions? Disregard that, I fixed it. Sound only seems to work when I keep the file mounted. It must get the sound files from the CD image. Hello! Im So Happy to find this page, and play old games extracted in original format, but, i really want to play the expansion of this game by the original expansion disc, you can get it? <3 much love and this page its recomended! i got diablos, sims, max pain and rolle coaster thank you! when i click install nothing happens? So, ive been searching everywhere for a digital version of this game. I have a windows 10 gaming computer, high specs. will this be able to download and work properly or do i need the older version of windows to do so cuz um…cant necessarily downgrade there. If this will work for my computer, exactly which download button am i supposed to click? there are three different ones on this page. thanks. Click on red “Download Link” above screenshots. green Magnet Link works if you have utorrent installed. then you need WinRar and PowerISO to extract/mount. CD. Won’t work on Win10 tho. Get yourself an old XP laptop or something similar. 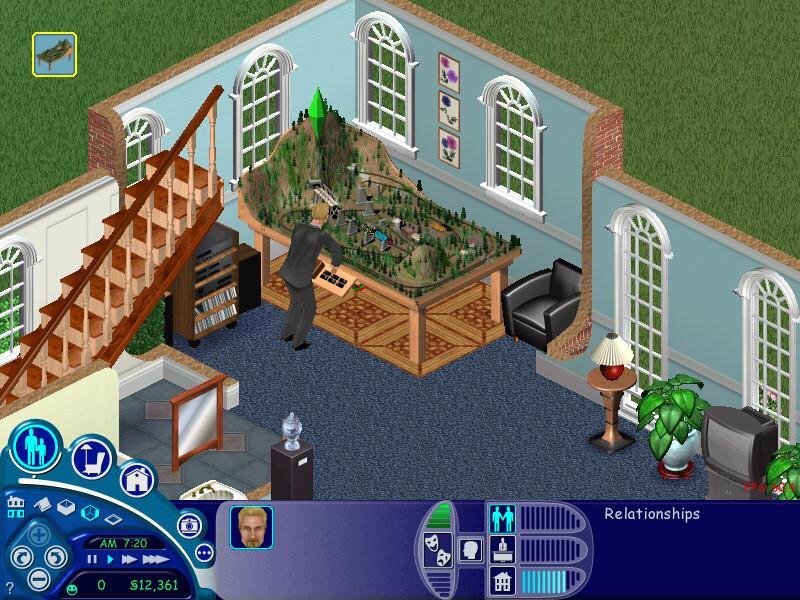 Screenshots were taken in XP, game only tested on that OS. Hi. I just download the game but is not runing. I have Window 10, what program is compatible with this game? 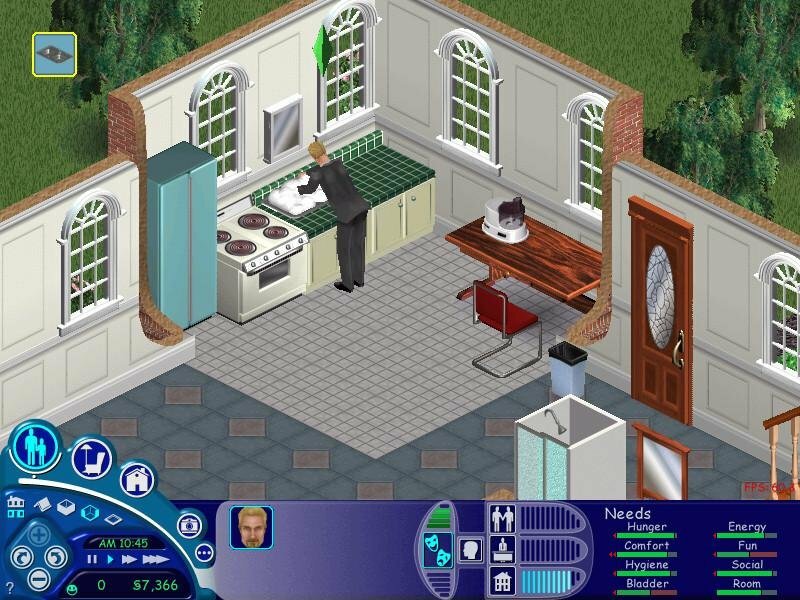 Followed the instructions above and got the “could not find the sims data directory” can anyone help? Did I miss a step? For saves problem, maybe do not install the game in Program Files directory or run the executable as admin. 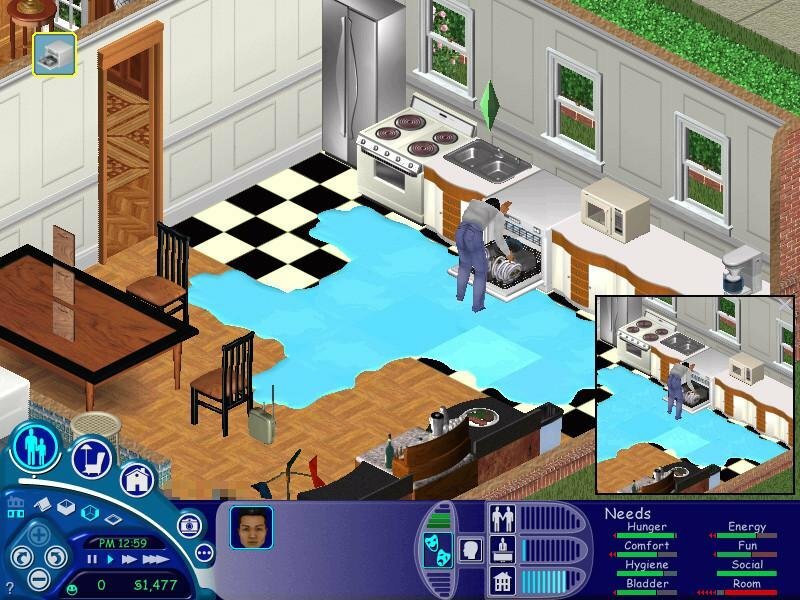 For “could not find the sims data directory”, I think this is an installation problem. 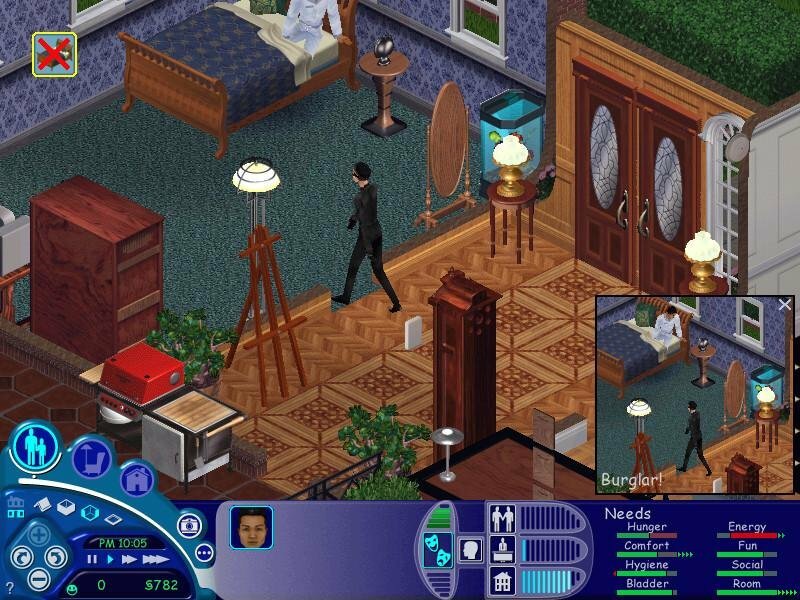 Try uninstall the game, and delete everything about The Sims in your Windows registry. Then reinstall. 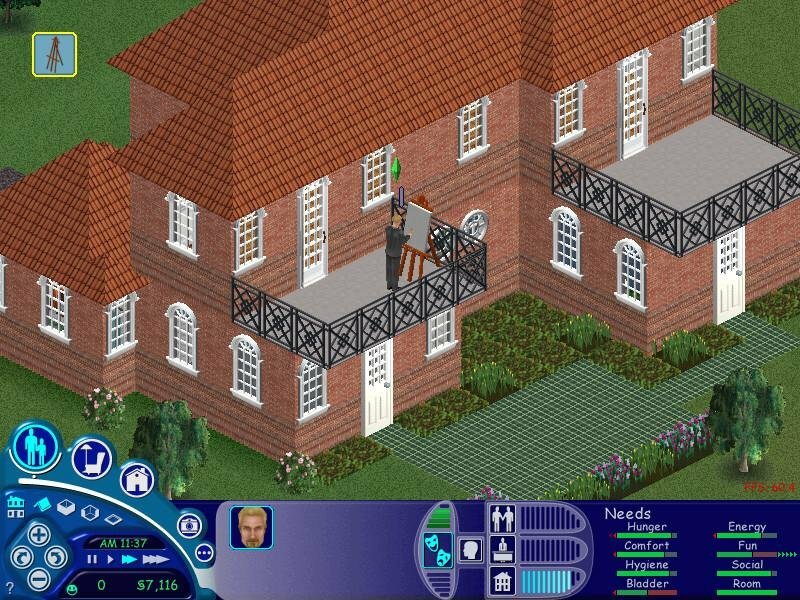 Got one for Sims 2? I saw that gave it away back in 2014 on something called Origin. why it doesnt work in u tourent?